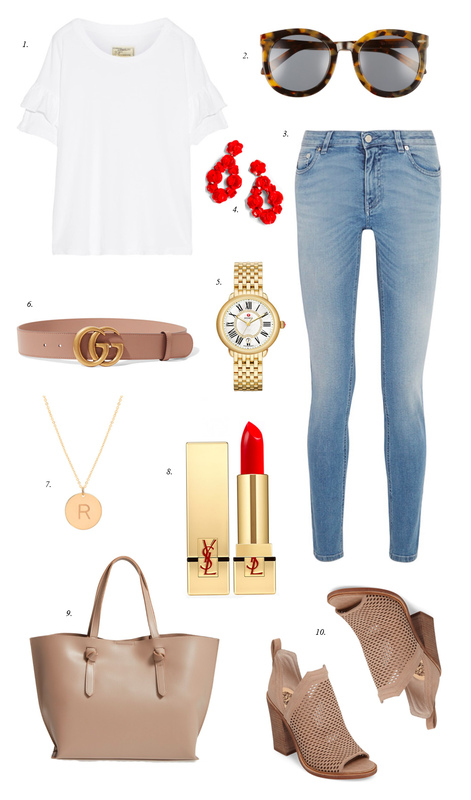 Here’s some outfit inspiration for your Tuesday morning!! Enjoy! Love this simple and casual outfit! That white tee is so cute! I love the subtle pop of red accessories! So cute! Any reasoning behind the picks? I absolutely love this look! The earrings add such a fun touch! I love the outfit you’ve created, the pops of red are perfect and I love the taupe pieces, too! Thanks for sharing and I hope you’re having a great day so far! I just did a red earring and lip pairing on my blog the other day…so fun for spring! So cute, those earring are so floral and beautiful! Perfect for spring. I love the detail on the tshirt! It looks so classic but has a bit of fun and uniqueness. Very pretty! Love the taupe with red, it’s such a unique color combo. So sad that gorgeous belt is sold out though! Loving the soft blush nudes and the reds. Such a rear combo! This is totally my kind of outfit! I love the fresh white and blue and then the pops!